Loeb & Schoenfeld, Embroideries, was founded by Jacob Loeb (1835/36-? ), David Schoenfeld (1851-?) and Max Schoenfeld (1850/51-?) in 1883. 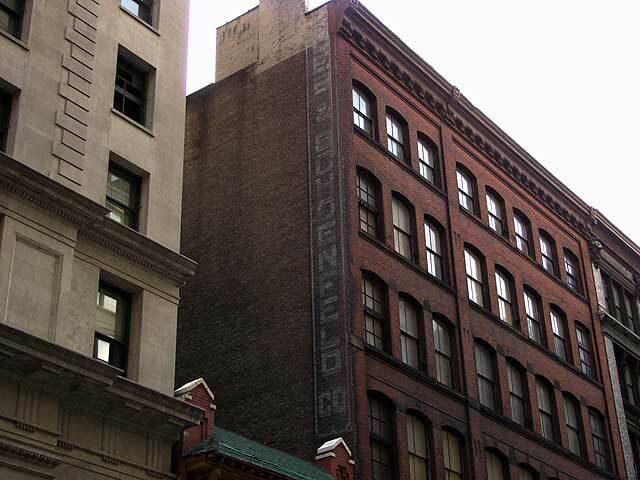 They were located in downtown Manhattan at 73 Franklin St. In 1880 Jacob Loeb, born Bavaria, age 44, was living in Cheltenham, Montgomery County, Pennsylvania with his nephew Louis Loeb, also born in Bavaria, age 26, and with Max Schoenfeld, born in Prussia, age 29. All three were listed in the US Census of that year as "Importer White Goods." David Schoenfeld was also born in Germany, although he seems to have immigrated somewhat later than his partners. The business moved to 27 W. 23rd St. around 1915. This sign is on the back end of the building which runs through to 24th St.
Louis Loeb (nephew to the original Jacob Loeb), vice-president and treasurer, died age 64 in 1917. David Schoenfeld continued as president until around 1925 when they left this location and settled at 1123 Broadway. They went out of business a few years later.